Let me start with this thought-there are a lot of ways to wallpaper and this is the way I put up wallpaper. The wallpaper I have applied has stayed over 25 years, so I know it works. The wallpaper I like best is the thicker wallpaper. My favorite is from Spain. 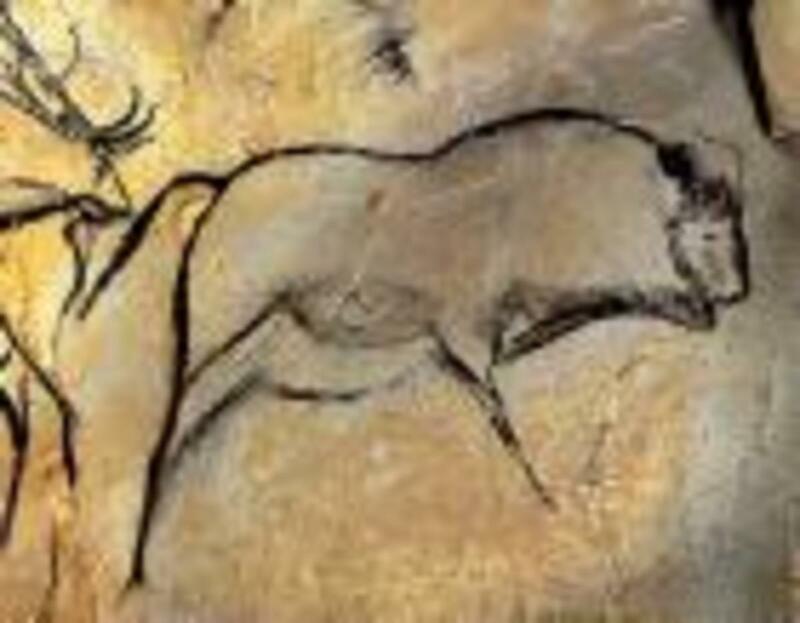 If you want to use a thin paper, there are a few things to do first to prep the paper for use. First, I spray three light coats, front and back of paper, with Matte Clear Acrylic Sealer. My favorite matte spray is Patricia Nimocks. If you are using a flocked wallpaper, only spray the back lightly three times. 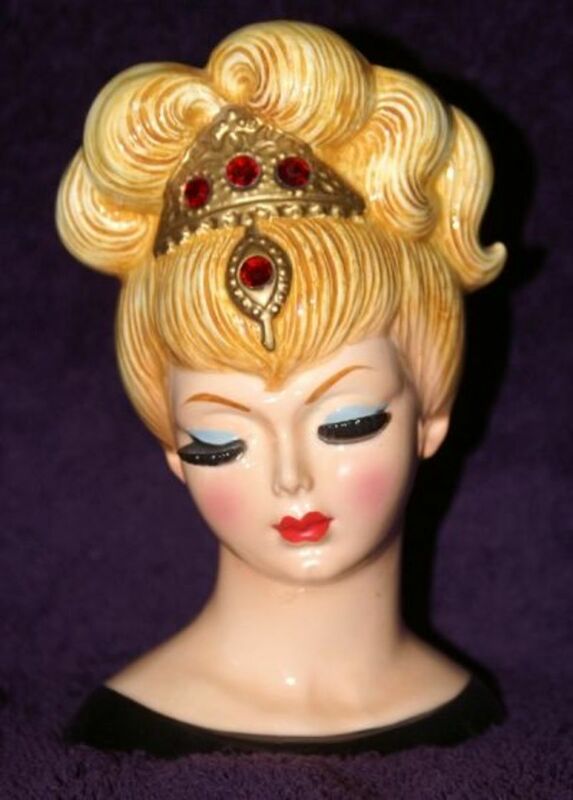 Handley House, Inc. is a worldwide distributor of dollhouse miniatures and accessories located in the United States. 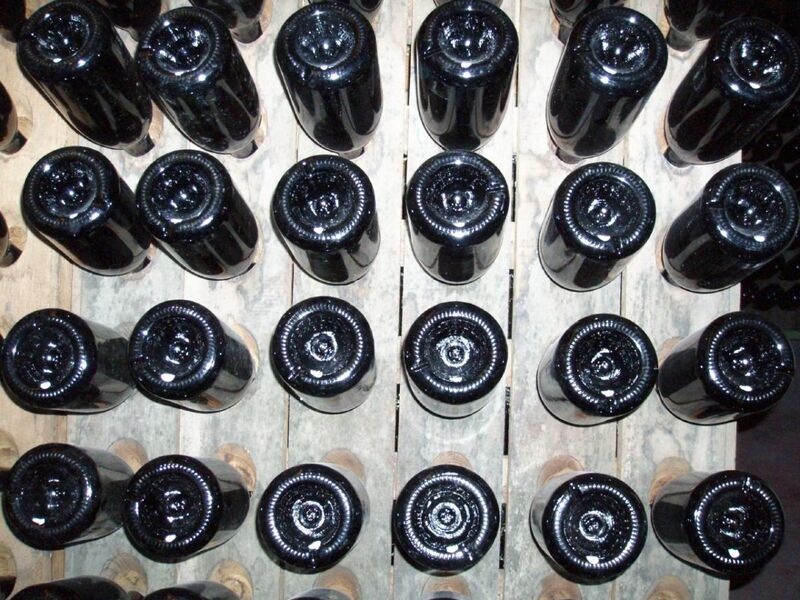 We have over 30,000 products in stock with volume pricing and discounts available. 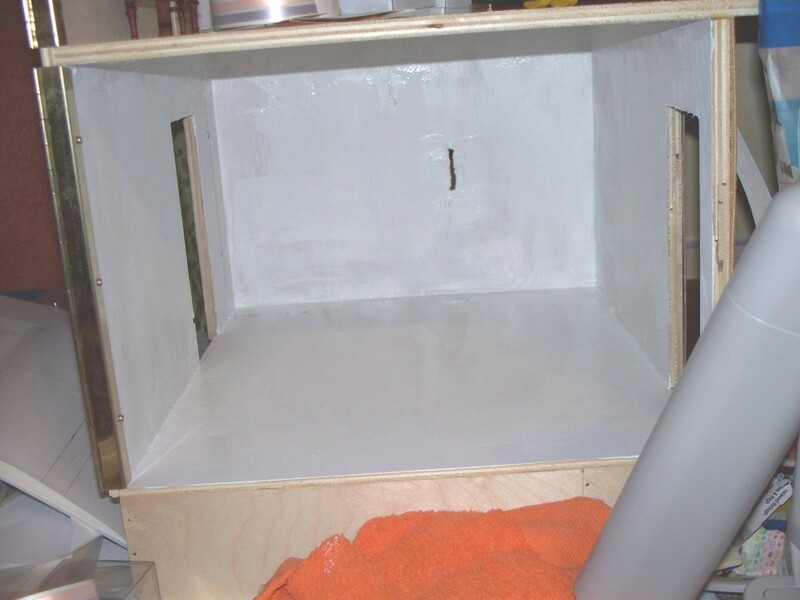 If your room/dollhouse has MDF or raw wood surfaces, it is a MUST to prime the walls with a good primer. If the surface you are putting wallpaper on has other wallpaper on it you can't get off or paint, you will need to put primer on the walls. If you are priming over old wallpaper or paint, you will need to use an oil base primer. 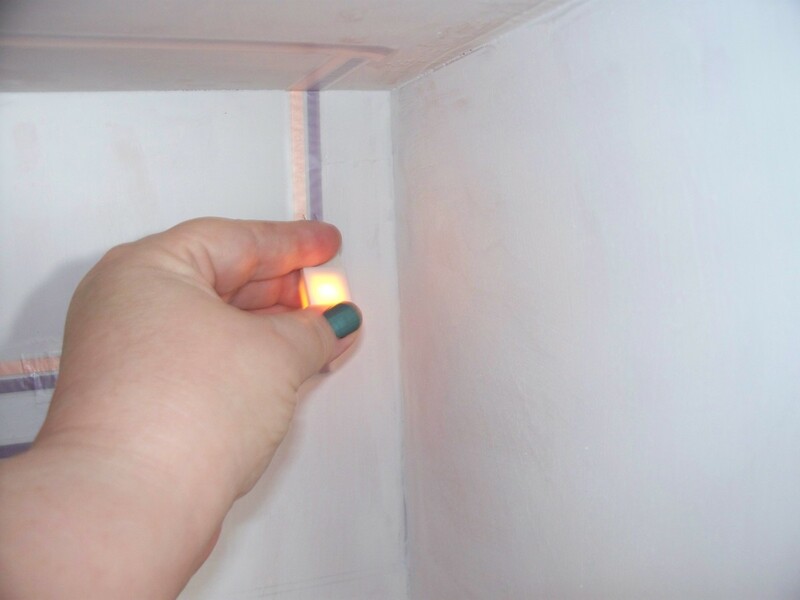 After you prime, run your tape wiring (if that is the way you are electrifing your dollhouse) and make SURE the wiring works BEFORE you wallpaper your dollhouse walls. Home Improvement and wall primer. To make sure your layout of the electrical and the wallpaper coincide, you will need to cut out a template. I use copy paper and blue tape to stick the paper together. I put each piece of the copy paper on one wall surface till the whole wall is covered-hold the paper together with blue tape or plain tape. I use each template to mark where lights go so I can mark the walls and the wallpaper. Some instructions say to put little nails in the tape wiring to mark the wallpaper-I find that too imprecise. 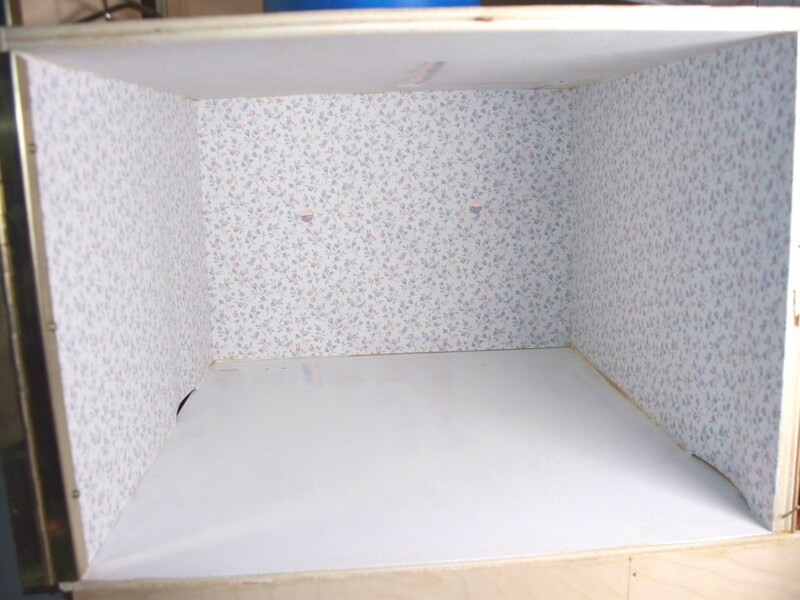 Wallpaper your back wall of your room-box/dollhouse first. Take your back wall template (make sure you put lots of markings on your template-which room, which wall, right, left back wall, etc.) and put it on top of your wallpaper. It is VERY important that you center your wallpaper pattern in the center of your template. Cut 1/4th inch extra on each side of the back wall wallpaper. 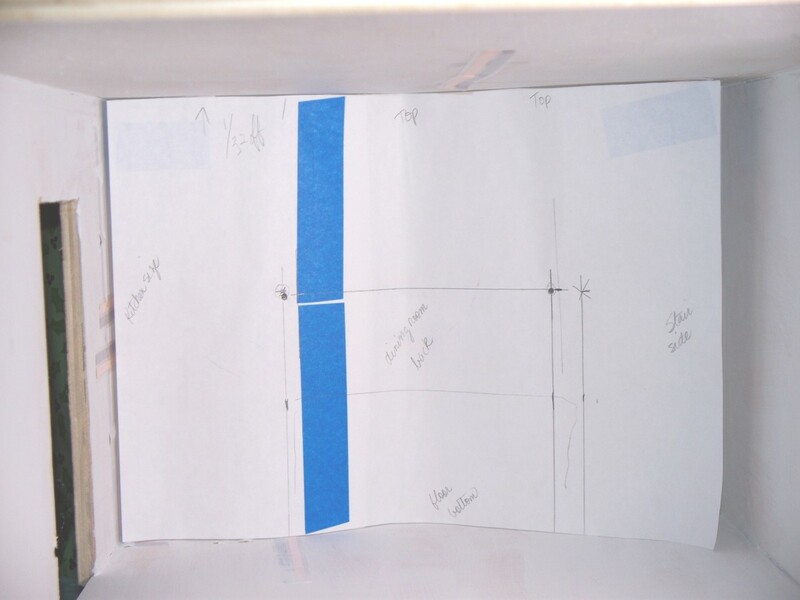 If your paper has a repeating pattern, you will have to cut out the right and left wallpaper now (make sure you measure 1/4th inch in on each side when matching the side paper pattern). 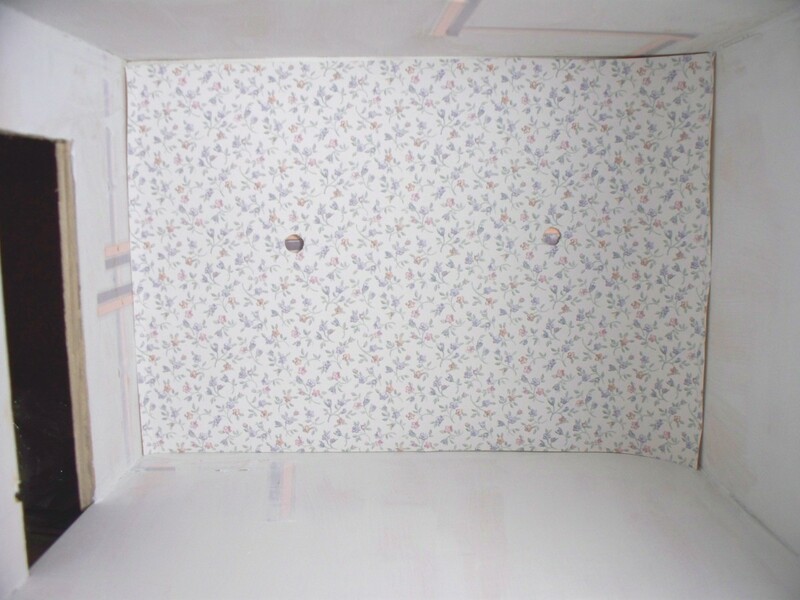 Take the back wall wallpaper and fold in 1/4th inch on each side, then DRY fit the wallpaper to the back wall. Also, make sure the right and left side wall wallpapers fit-DO NOT CUT OUT DOORS OR WINDOWS NOW. I find it makes for a neater look if the front edge of the side wall wallpaper is folded under. I glue the folded under piece with Grrrip glue. It sets fast and you can keep on wallpapering. I would like to introduce you to the miniaturist's greatest tool-the plastic credit card. I really can't remember where or how I discovered it, but I use them for everything. I have a huge stack-they are not hard to collect. Also, they can be cut into whatever shape you need. Back to wallpapering. I use Grandmother Stover's or Yes Glue to apply wallpaper to the wall-it has served me well for over 30 years. 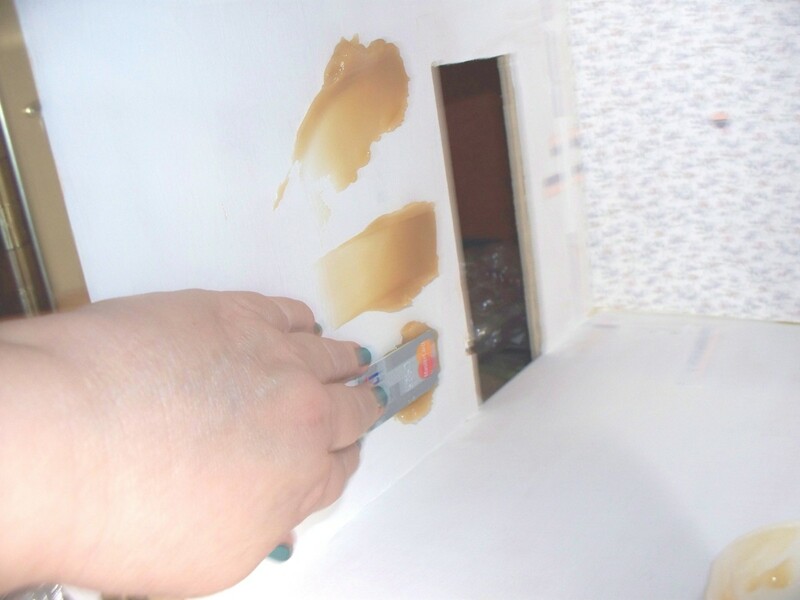 I take a small piece of the cut up plastic card and scoop out about a tablespoon of wallpaper paste and put it at almost to the top of the wall I am working on. Then another glop in the middle and near the bottom. I take a whole credit card and move it all over the surface of the wall. Make sure it is applied to all the wall and you don't leave big globs. I apply wallpaper to the back wall first and let it dry a day. Then I do both sides and let them dry a couple of days. Before you do this step, go get a dampened washcloth (damp, not drippy). First, we are putting the back wall paper up. 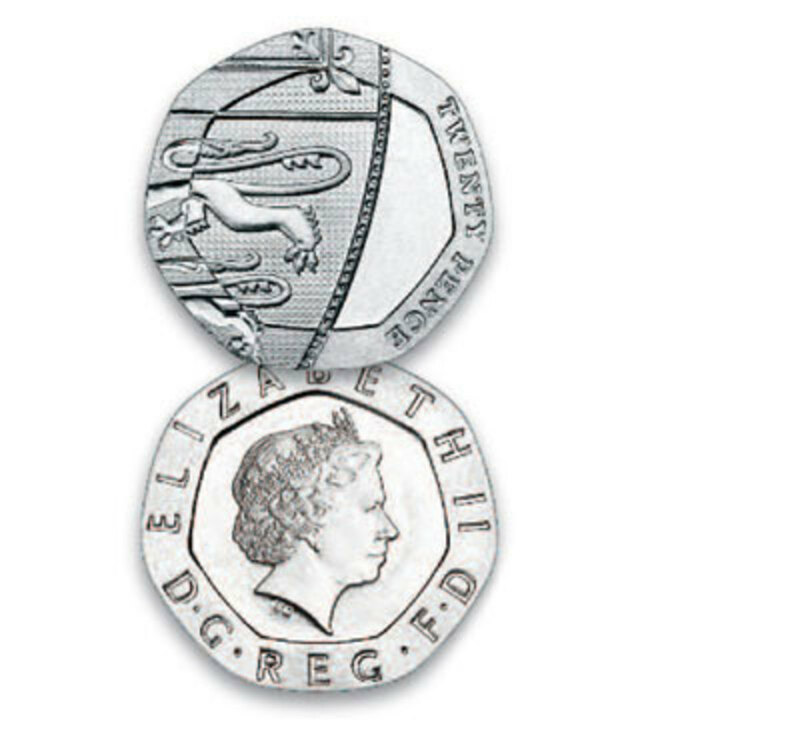 Take the 1/4th" left folded edge and put it in the left corner (or you can do the right side). MAKE SURE YOU HAVE PASTED 1/4TH " ON THE LEFT AND RIGHT SIDE WALL-if it isn't pasted It won't stick. You only have ONE chance to put this paper up. Now put the right side of the fold in the right corner (or left side if you did the right corner first). Then gently push the wallpaper on the wall. This is if you are using the thick wall paper. If you are using thin wallpaper, gently put it down one side to the other-work fast so the thin paper does not absorb the moisture. With thin paper, you could work from the middle of the wall to either side-pat all over once with your hand. 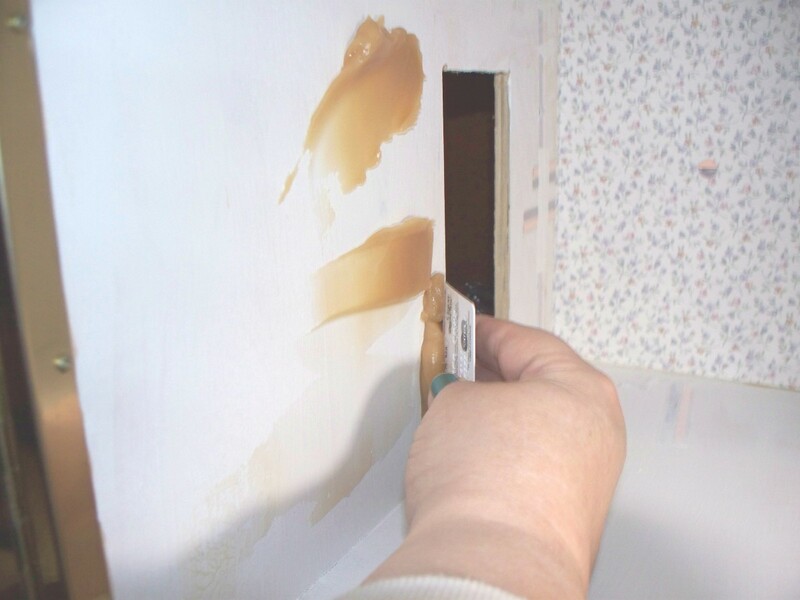 Use your whole plastic card to smooth out the thick wallpaper. If the thin wall paper gets bubbles after a few minutes, make a cut with a craft knife (#11 blade) and gently push the paper down. On thick wallpaper with a shiney surface use the damp cloth to get the excess wallpaper paste off. On the thin wallpaper, use a dry kleenex. 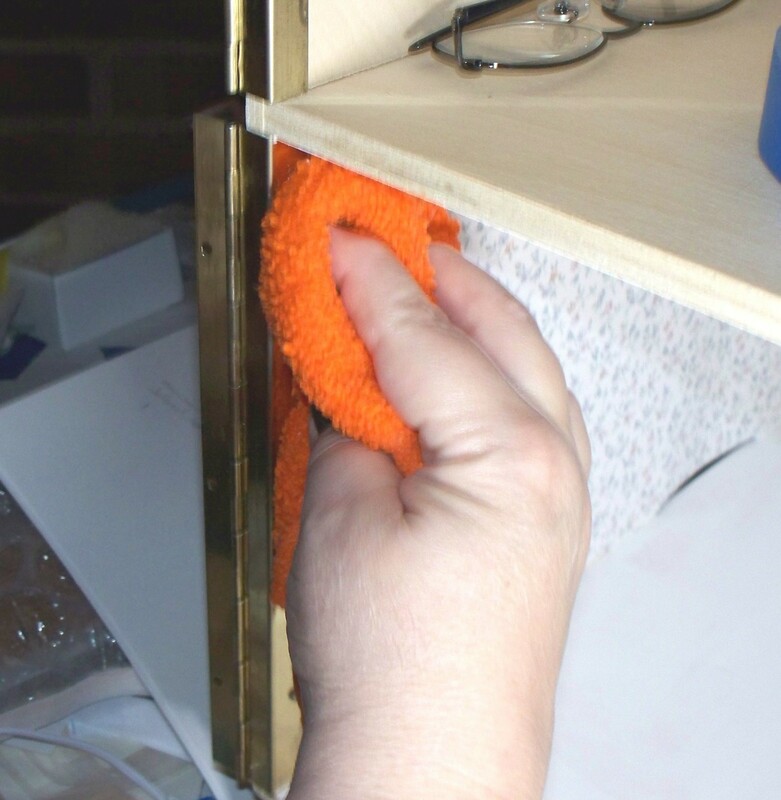 If you are using flocked wallpaper, don't use the plastic card or damp cloth-pat with hand. Another way to put up thin paper (I do this a lot) is apply it with spray adhesive to acid free white cardstock and apply the whole thing to a wallpaper pasted wall. 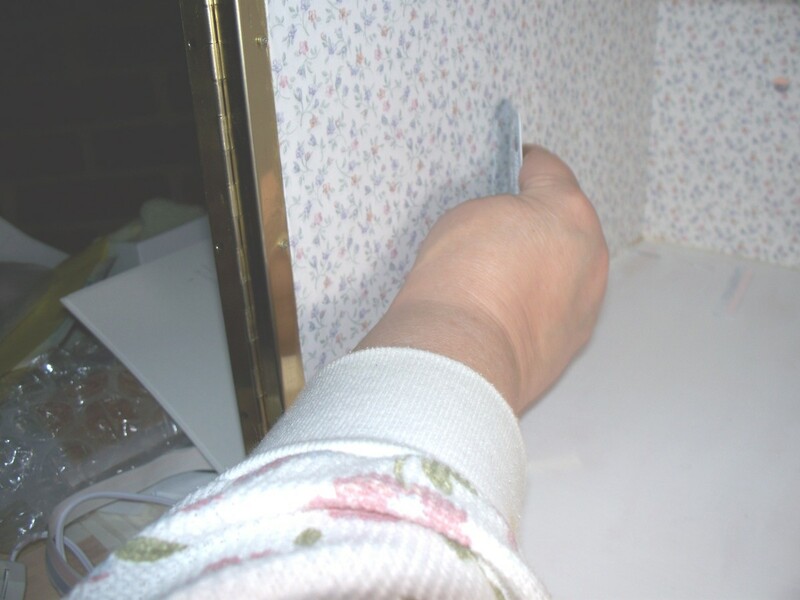 In putting the sides up, put the folded edge right along the front edge of the room wall, then work from the front and pat the wallpaper down till you reach the back-work quickly. Follow all the suggestions in the paragraph above. Take your time and do ALL the steps, esp. the dry fit. When completely dry, take a craft knife (#11 blade) and cut out window and doorway opennings. Ta Da-you have wallpapered your walls. 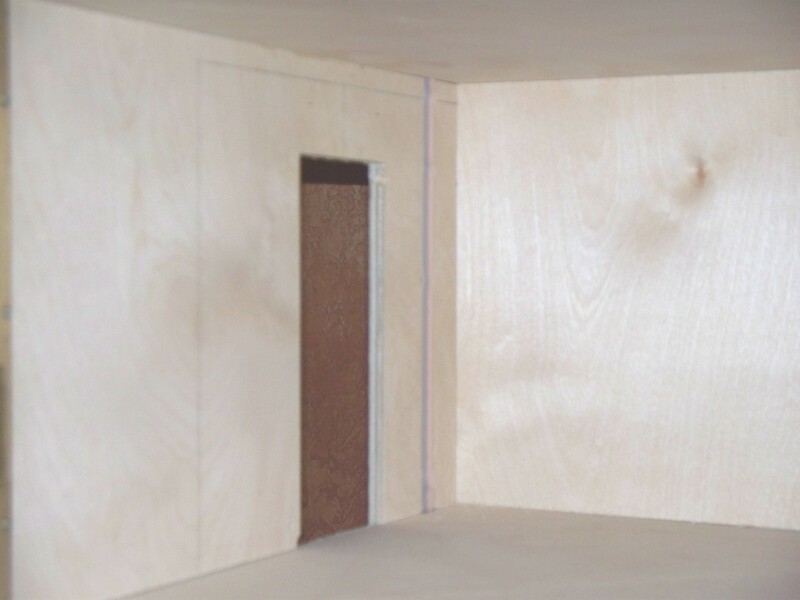 Wooden dollhouse kits, dollhouse furniture and miniatures forum. 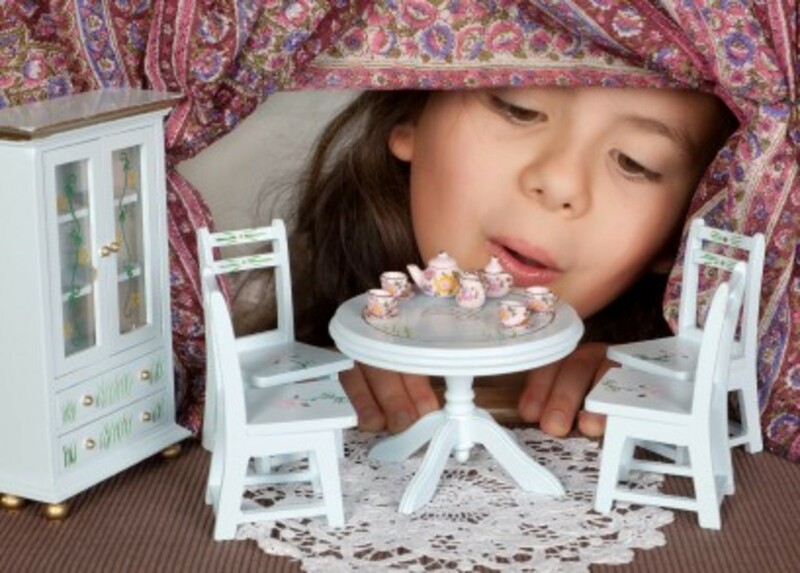 We've been making dollhouses for 60 years! Hi loret, I'm sure you can make your own paste. I wouldn't. 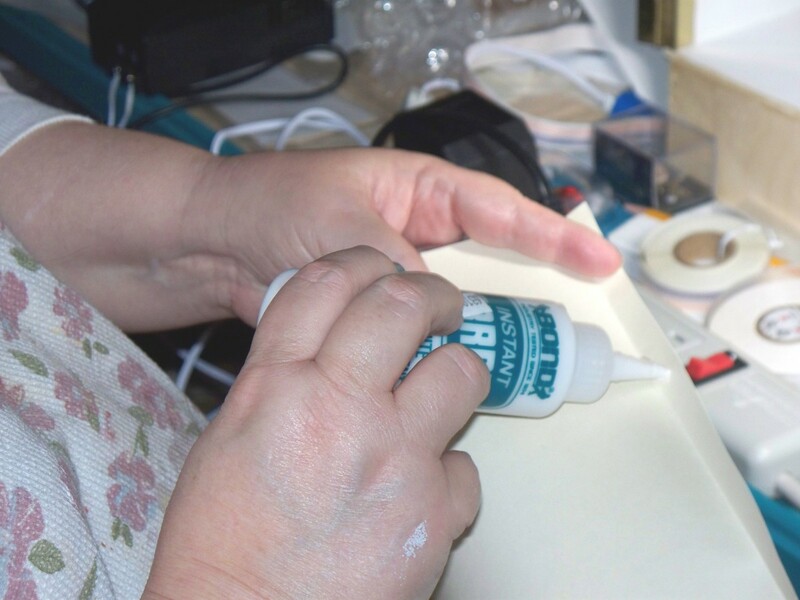 Grandmother Stover glue is in reality, bookbinding glue. I know there is a recipe for that somewhere. Google it. can yu make yur own glue/paste? Just a follow-up to my problem using scrapbook paper to wallpaper my doll house. After trying many glues and pastes, I found that a spray adhesive worked beautifully. No bubbles or wrinkles and it gave me a couple of minutes to get it in place before setting up. Hope this helps someone else in the future. I'm trying to wallpaper a dollhouse made from a laminated ikea bookshelf using scrapbook paper and mod podge. It's all wrinkled and bubbled up. Any ideas? Looks so nice and neat. I recently did a doll display box using scrapbooking paper. I wish I had read your article first. LOL! I'll try again using your instructions. Thanks!! It is difficult to say what to do, but here goes. Use a wallpaper scorer, then spray w/wallpaper remover. When dry, lightly sand w/fine sandpaper. Put a coat of oil base primer over the walls. Again, lightly sand w/fine sand paper. If the walls are smooth, wallpaper away. If the existing wallpaper won't come off do I try to get it off or just wall paper over it? Won't it just show through? Emily, I am so glad my hub was helpful. You can use any thing for wallpaper. If you use plain paper (scrapebooking paper, etc), I would spray each side with matte acrylic spray at least 3 times on each side (make sure it drys between each spray). Now for the card stock-you will have to be patient with it. It is thick and stiff. Do everything the same, just make sure the pieces are cut to exact sizes. Using a scrape piece of the card stock, I would try and experiment with alternate glues. Not on the card stock but on the wall. See what works best. If you have any more questions email me at katescats@msn.com. Love to help. I'm looking at my option for wallpaper in my dollhouse. 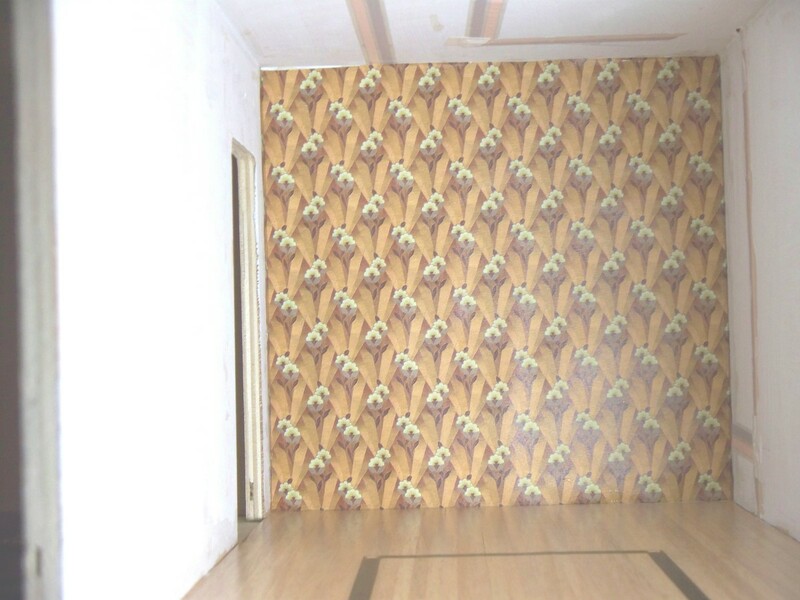 I've only found limited options of actual dollhouse wallpaper in a store in town, have you ever done/heard of using cardstock or scrapbooking paper as wallpaper in a dollhouse? This is a really useful hub. I need to re-paper my dolls' house so this will help. Thanks.